Ten months is a long time in the TV standardisation business. Last November, the DVB was hoping it had nailed the UHD standardisation problem and neatly side-stepped a format war by including within its UHD-1 Phase 2 norm two rival systems for High Dynamic Range (HDR) – namely Hybrid Log Gamma (HLG) and the ten-bit variant of Perceptual Quantizer (PQ-10). HDR is the technology that brings extra ‘sparkle’ to UHD TV pictures both through higher contrast and its associated wider colour gamut, and it’s now considered to be as important as 4K resolution, if not more, to future consumer adoption of ultra-high definition television. PQ, developed by Dolby as part of its Dolby Vision standard, is favoured by the Hollywood studios and OTT providers such as Netflix. However, it is not backwards-compatible with existing receivers which use Standard Dynamic Range (SDR). HLG, meanwhile, which was created by the BBC in collaboration with Japanese broadcaster NHK, was specifically designed to be backwards-compatible with SDR sets and to favour live production workflows. The DVB position last autumn was that industry players were free to use either approach, depending on their requirements. This would cause few interoperability issues, it was thought, because it was straightforward to transcode from one to the other, and manufacturers were creating 4K panels with both options included. However, not all DVB members were happy with that compromise, admits MacAvock. “Some of our members have stipulated that they would like to have mechanisms that are more sophisticated,” he says. Enter four new HDR variants from Dolby, Philips, Qualcomm and Samsung, which unlike the previous two are ‘dynamic’ rather than ‘static’ – that is, they support metadata that changes scene-by-scene rather than metadata that is constant throughout the entire film or video. One HDR-related profile that the market may require more urgently is the marriage of HDR with HD – as opposed to 4K – resolution. 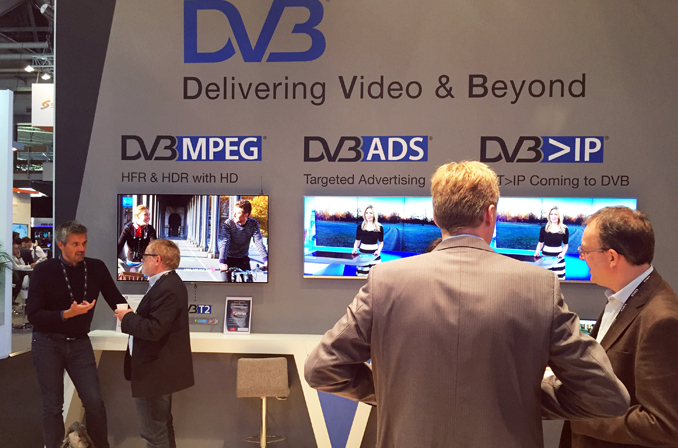 DVB played down the possibility a year ago, but this year the combination provided one of the main demonstrations on DVB’s IBC stand. The HD-plus-HDR profile works well in part because an increasing number of 4K TV sets are able to upscale HD signals to UHD very effectively, MacAvock points out. “Particularly on a 55-inch [4K] set, if you put that in front of a substantial proportion of the public, I would argue they won’t know the difference,” he says. “This enhances the DTT platform to the extent where it can now compete with other similar platforms that maybe have a dearth of bandwidth – so we can address the deficiencies of the DTT platform in that regard,” he concludes.